Back cover blurb: A tale of a single night. The story of a lifetime. If you had to pick five people to sum up your life, who would they be? If you were to raise a glass to each of them, what would you say? And what would you learn about yourself, when all is said and done? This is the story of Maurice Hannigan, who, over the course of a Saturday night in June, orders five different drinks at the Rainford House Hotel. With each he toasts a person vital to him: his doomed older brother, his troubled sister-in-law, his daughter of fifteen minutes, his son far off in America, and his late, lamented wife. And through these people, the ones who left him behind, he tells the story of his own life, with all its regrets and feuds, loves and triumphs. Beautifully written, powerfully felt, When All Is Said promises to be the next great Irish novel. Eighty Four year old Maurice Hannigan has a toast to make, well five in fact, for all those who’ve had a major influence in his life. At the bar in Rainford House hotel he raises a glass to his late brother, his beloved sister-in-law, his late wife and daughter, and lastly his son. There is a different drink for each individual, and a different period of time and Maurice's life explored. Over the course of the novel we really get to know this character and come to love him. For the reader, the atmosphere is almost as if you are sitting in that bar there with him, listening to him tell his tale, winding up the staff behind the bar mischievously. I don't usually say this, but I think this book would make a beautiful TV series or film with the right actors treating the novel sympathetically. When All Is Said is a beautiful and unique novel and I can't wait for the author's next. 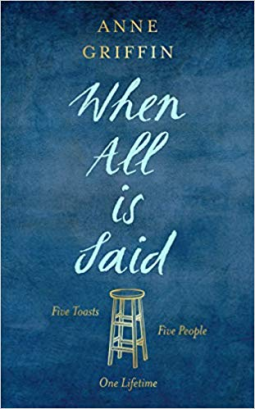 When All Is Said is available now via Amazon online and all good book shops. Thank You for to the publishers who sent me an advanced proof copy of this novel in exchange for an honest review.